Reporting on framing patterns in news coverage on cultural themes, in a fun, small dose. In this latest edition of Culture Shots we are broadening our scope and turning to Russia and Russian media. We decided to look at how Orthodoxy, the traditional religion of the majority of the Russian citizens, is represented in the mainstream Russian media. Orthodoxy is about … a movie? The most frequent terms — Matilda (матильда), film (фильма) — in our sample were related to an ongoing conflict about the upcoming movie “Matilda“. Matilda is the story of a love affair between the young heir of the Russian throne, the last Russian emperor Nicholas II, and Matilda Kshesinskaya, a ballerina of the Imperial Theatre. Though not many people have actually seen the movie, which is scheduled to be released on October 25, it has caused a huge controversy. The problem? Natalia Poklonskaya has opposed “Matilda” for a long time, provoking extremely unhealthy, if not sectarian tendencies among the orthodox population. On August 31st, there was an attempt to set fire to the film studio “Lendoc”, where work on “Matilda” had taken place. To get a broader picture of how the media talks about orthodoxy, we widened our scope to include six months of articles. Matilda has been a main topic in this period as well, but other stories also caught our eye. In the word cloud, some of the most significant key words are activists (активисты), feelings (чувства) and believers (верующих). Why? 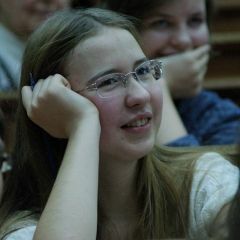 Since insulting the feelings of religious believers’ is a crime, Orthodox activists often appear in the news, claiming to defend Christianity and even the general morality of Russians against offenders – artists and bloggers in particular. Russian Orthodox Church representatives have called for the tightening of age requirements for the “Simpsons” series due to the latest episode which features the main hero catching Pokemons in a church. According to certain priests, there is “an active propaganda of false moral values among teenagers” on the media market. Or take the example of the controversial transfer (передачи) of Saint Isaac's Cathedral (собор) in Saint Petersburg, which is currently a museum, back to the Russian Orthodox Church, along with several other churches throughout the country that often served as offices and warehouses in the Soviet times. “Operation Saint Isaac”, as one Russian media outlet calls it, stirred up a heated debate in the city, sparking both street protests against, and sacred processions in favor of the transfer. Although Russian Orthodoxy was the focus on our exploration, the words Ukraine and Ukrainian (украинской) also appeared in a number of our stories. This makes sense, as Orthodoxy is also a primary religion in Ukraine. Authority over the Orthodox population has also become part of the recent conflict between two countries. 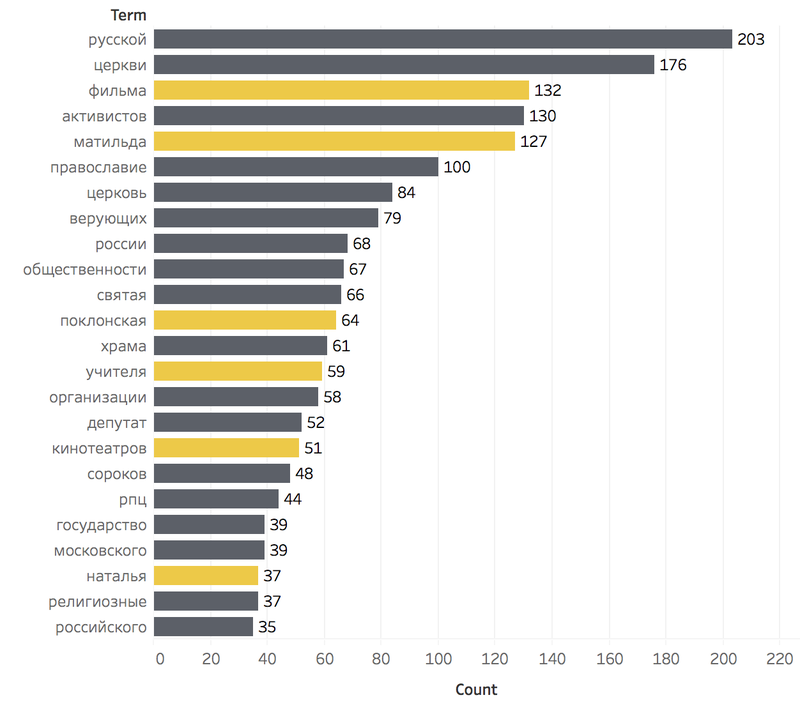 Though many of the story results focused on controversy, other topics related to Orthodoxy also appeared, in both Russia and Ukraine. Archpriest of Ukrainian Orthodox Church Aleksandr Klimenko became the winner of the popular music competition “The Voice of the Country” on the TV channel «1+1», «Strana.ua» reports. The priest represented Tina Karol's team. Easter celebrations (пасхи and праздник) occasioned discussions in the media about personal faith and benevolent practice, as with Patriarch Kirill's Easter address. This practice includes the veneration/esteem of shrines or “holies” (святыни) by thousands. 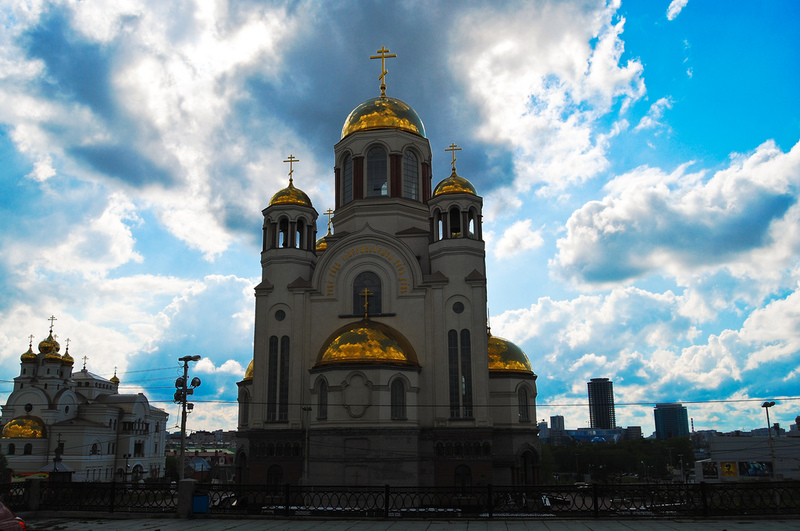 “On May 21st, the relics of Nikolaos the Wonderworker, or, as it is more correct to say, Holy Hierarch Nicholas, a bishop of Myra, one of the most popular saints in our country, arrived in the capital of Russia from the Italian city of Bari. Yet the specter of “offended believers” is never far away in Russian news coverage, as with MP Poklonskya's July petition of 100,000 signatures to prevent Matilda from ever making it to the screens. It would seem that when mainstream Russian media talk about Orthodoxy, it is often connected with reactionary politics and controversies. But there are additional frames to be explored, especially the diverse cultural aspects of a religion that claims 150 million members. We hope we've whetted your appetite for further exploration. Here are some related stories on this topic from Global Voices, happy reading! Correction: the dates related to Ruslan Sokolovsky's case were updated to mirror the actual timeline.